Posted under Parents' Articles. Updated 16 January 2018. 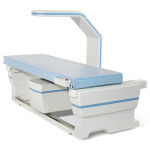 DXA stands for “Dual-energy X-ray Absorptiometry”. It’s the most widely used method to measure bone density (how solid a person’s bones are). The test doesn’t hurt. There are no shots or medicines to take. The machine is open, which means your daughter will not be enclosed in the machine. Each scan takes approximately 1-6 minutes. How should I help my daughter prepare for the DXA scan? Your daughter should NOT eat foods high in calcium for 3-4 hours before her DXA scan. These foods include: milk, cheese, yogurt, and dark green leafy vegetables. Your daughter should NOT take calcium supplements, vitamins, or TUMS® the day of her scan. Your daughter should wear comfortable clothing (including undergarments) without metal buttons, hooks, snaps, or zippers because metal interferes with this test. If the clothing she wears to the appointment will interfere with the scan, she will be given a hospital gown to put on. Your daughter should remove any jewelry and all piercings (if possible) and leave them at home. If she can’t remove a piercing near the scan site, tell her provider when you first arrive to the appointment. Your daughter may drink water and other CLEAR liquids before the scan. Your daughter may take any regular medicine well before the exam (if her health care provider agrees). Preparation for DXA scan is based on the procedure at Boston Children’s Hospital and may be different in other health care facilities. The technician will ask your daughter questions about his/her medical history and explain the procedure. Your daughter will have her height and weight measured. A routine pregnancy test is done in most hospitals on all menstruating females. The technician will explain what to expect and answer any questions you may have. Your daughter will be positioned on the table according to the type of scan she will be having. She will be asked to stay still and not talk during the entire scan, but she should breathe normally. A machine shaped like an upside down “L” will slowly move back and forth over your daughter’s body to measure the bone density of her total body, spine, and/or hips. The machine will not touch her body. Should I be concerned about the amount of radiation my daughter will receive? No. The amount of radiation is much lower than that of an x-ray. In fact, it is even less than the amount of radiation that a person would be exposed to if they took an international flight. When will we get the results of my daughter’s DXA scan? Results are not typically available on the day of your daughter’s appointment. The DXA scan must be carefully reviewed by the technologist and a doctor specializing in bone health. The HCP ordering the DXA scan will usually review the results with you and your child within 2 weeks either over the phone or at his/her next appointment. If needed, a follow-up scan will be done no sooner than 1 year from the prior scan.